Giving thanks – My thoughts on a page. As it’s Thanksgiving for many of you I of course got thinking and began to wonder at the many different ways we can feel thankful. This day two years ago a very sick Daniel came home. We busied ourselves readying a bed and room for him, filled with mixed emotions. Knowing his greatest wish, to return home, had been granted to him. Knowing only days earlier we feared a different end as he lay hooked up to a ventilator. Knowing his time at home would be short. To feel such relief and agony in the same moment was something none of us can ever forget. Daniel had three days at home which were filled with joy, peace but mostly love. His home, which should have been the saddest place on earth, was filled with singing and laughter as those who loved him gathered around reminiscing. Those few days mirrored the way he lived. Where ever Daniel was there was fun to be had. Shortly after losing Daniel his parents were given a copy book from his school. In it was a short piece, written by Daniel himself, about how he thinks others see him. 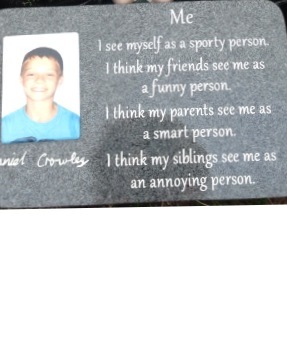 His parents have placed his words on a small plaque by his grave. These days when I go to say a quick hello to him I come away smiling. His own words, a fitting tribute to a boy who knew how to put fun into life. It’s also a wonderful reminder of the boy Daniel really was and how lucky those were who could call him a friend, a cousin, a godchild, a brother and most especially a son. Posted in Daniel's story, Family, grief, inspiration, Journeying through grief, life, personalTagged death of a child, giving thanks, missing someone, remembering a loved one. Thank you for this. I liked seeing his words and his photo. What a wonderful gift he gave to so many. He did indeed. Thank you Corina. It was lovely to have found his words after he had passed away. It’s always fun to see the world through the eyes of children. So wonderful that his words can still bring joy after he’s gone. Awesome post. Have a great weekend! Thank you. Yes it’s lovely to read his own words. The simplicity of a child. I love his words Tric, it shows he knew others and knew he himself was different things to different people. I always think of the word “cheeky” when you write about him and it makes me smile. Thanks Colleen, you’re comment made me smile. He was indeed ‘cheeky’ in the best possible way. That’s such a nice tribute to a special boy. Tric, what a lovely post, even though so poignant. I know this week is very tough for everyone who loved Daniel. I hope you can find a new way as well as an old way to celebrate his life. That was advice given to me relating to my mother’s anniversaries and it had certainly helped a lot. jx P.S. I’ll be casting the stone for D on the 29th like last year. Thank you so much. Anniversaries are difficult days but also days in which his family know how many are still thinking of Daniel. I love the idea of you once again casting a stone into the sea for him and your nephew. Thank you. I too will give a nod to your nephew and light a candle side by side with one for Daniel tomorrow. I like your idea of finding a new way to celebrate his life. I think the Christmas day swim has become that. It’s so soon after his anniversary and began by a group of friends who wanted to remember him on such a special day. It mushroomed and last year about 100 came. This year looks like being just as big. It’s a sponsored event with the money going to those in the mercy who looked after him so well. It’s a lovely way to spend Christmas morning, so many talking about him and laughing as they remember him in all his fun and craziness. Thanks Tric and I hope tomorrow is bearable. The idea of the Christmas swim is great. I was talking more in terms of each anniversary and doing something new (as well as old) every year. I mean little things ~ maybe planting a shrub or some bulbs that have special meaning or sitting down and doing a painting that you’ll keep forever. (I’m no artist but find playing with paints very relaxing and it’s nice to have a ‘masterpiece’ to mark a day.) Just ideas to help you through! and on this day, as well as all others, i try to be thankful for all of these special people, like daniel, who come into our lives and who teach us things about what matters most in life, even if it is for a short stopover. Thanks for your kind thoughts. We got through the day well. As is often the case the thought of the day is often harder than the reality. I hope your daughter continues to stay well for many more years and with each passing year comes greater medical knowledge and progress. Even though it’s so hard for Daniels family they do remember him very regularly with smiles.